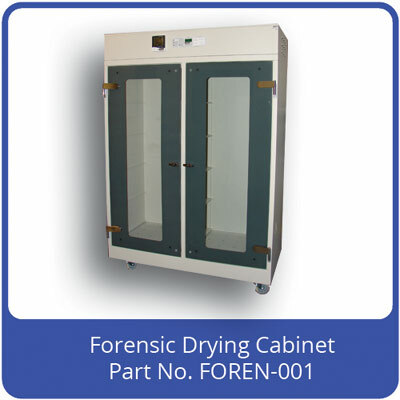 What is the Forensic Drying Cabinet ? The Forensic Drying Cabinet is an enclosure held at negative pressure by a HEPA filtered supply of air. All air handling components (fans, filters, instrumentation and controls) are built-in, with only a mains connection required. In addition, the cabinet has integral batteries to allow it to continue running throughout a mains failure. The main application is in the Forensic Laboratory where the cabinet may be used to store clothing containing forensic evidence. Here, the filtered air prevents any contamination to the evidence whilst also drying out any saturated garments. The cabinet has a fan located behind the control panel at the top which draws air through at an automatically controlled rate. The air enters at the bottom, through a pre-filter then HEPA filter and exits at the top, through another HEPA filter. The ventilation rate is shown on a digital display, along with the internal temperature and humidity. The Forensic Drying Cabinet creates an environment free from background contamination. As it runs at a negative pressure and has exhaust ventilation, it simultaneously protects the room and occupants from any internal contamination. This may include allergens and toxins so is a significant health and safety benefit to lab workers.